The grocery store chain with a cult-like following is ready to take on New York City, with their first store there opening on March 17th. The day has been anticipated for months by some New Yorkers, who had to adjust to life without the unique products offered on the shelves of the California-based chain. Julia Moskin in the New York Times gives New Yorkers an introduction to the company, with information on the background of the company and what is involved in making and selecting the products which appear on the shelves. Food goes through a tasting panel which meticulously examines every proposed new addition to the stores, tasting and judging with great care. She also has an article on New Yorkers who have moved into the city from areas which had Trader Joe's stores and how they crave their favorite items, and how they will go to any lengths to obtain them. 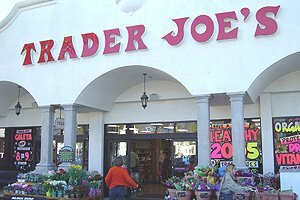 *Items which I've had from Trader Joe's. This reminds me...I need to make a trip to Peabody store very soon, I'm almost out of coffee, Olive oil, frozen fish fillets, and blue corn chips.